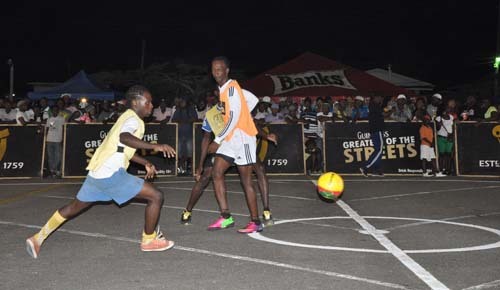 Part of the action in the Group Stage of the Georgetown Zone of the Guinness ‘Greatest of de Streets’ Futsal Competition. 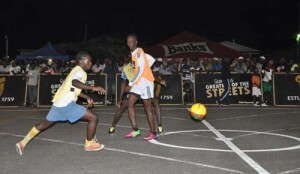 Zone of the Guinness ‘Greatest of de Streets’ Futsal Tournament with a huge upset win over defending champion Queen Street of Tiger Bay, registered another victory on Tuesday evening, at the National Cultural Centre Tarmac. Playing in the first fixture of the night, West Back Road after being held to a goal-less stalemate by North Ruimveldt in regulation time, managed to earn full points after succeeding 4-3 in a penalty shootout. Other notable performances of the evening came from South Sophia, who thrashed Stevedore Housing Scheme 4-0, Festival City who won 3-0, West Front Road and Festival City Warriors. Action was set to resume last evening at the same venue, while more matches will be played this evening also at the National Cultural Centre Tarmac.